Montgomery Astilbe is a deep red false spirea. 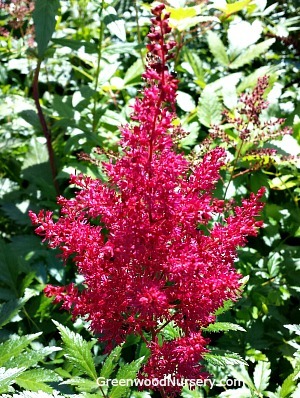 The striking red plumes sit atop green foliage of this astilbe. Use this colorful Montgomery Red for naturalizing woodland gardens and other semi-shaded areas. Blooms appear in early summer. Companion plants for the Montgomery Red Astilbe are part shade loving hydrangeas like the Annabelle, Ruby Slippers and Bobo. Plant with partial shade loving perennials: Autumn Brilliance, Sub & Substance Hosta, and Astilbe Bridal Veil. Montgomery Astilbe is growing in a one gallon container. Plants shipping to AZ and CA will be bare rooted before being prepped for shipping.